Another improvement to Photoxor C1, the photography calculation tool with GPS tracking. Download the new version from Google Play now, it's free! 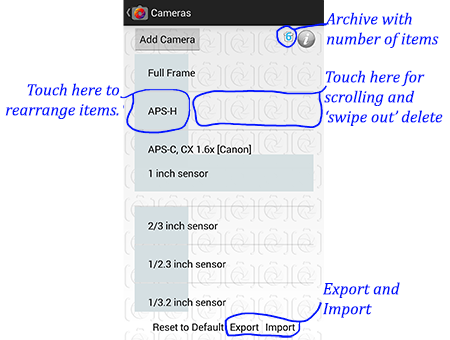 It got easier to work with the lists for Cameras, Filters and Prints! With a quick drag you rearrange the order of items, for example to present the mostly used ones on top of the list. Export your definitions to an XML file; share with other Photoxor C1 users. Import definitions from an XML file. Delete a definition with a quick 'swipe out' to keep only definitions you use regularly (you could export the full list, just in case you need a definition later). In case you deleted a definition by accident, the archive allows you to restore. Please note, that the archive is cleared when the application is ended and also when the definition list is replaced (either from Import or Reset to default values). Use the Export button to export all or some of the definitions to a XML file. A dialog allows the selection of the definitions to be exported. The export file must have a suffix of .xml or .XML, otherwise .xml will be appended automatically. to transfer definitions between devices running the application. The file must have a suffix of .xml or .XML. to show in the file selection. A dialog allows the selection of the definitions to be imported. Replace: The original list is replaced by the imported definitions. Please note that the original definitions are permanently deleted, and cannot be recovered. Add: The imported definitions are added to the original list. You might prefer to show the most often used definitions at the beginning of the list. To rearrange an item, touch the line on the left side (inside of the gray area) and drag to a new location. To delete a definition, touch the line on the right side (outside of the gray area) and swipe to the right. The item will disappear from the list and transferred to the archive. Use the archive function in case of accidental deletion. Deleted definitions are held in a temporary archive while the application is running. In case you accidentally delete a definition, use this archive to restore it. archived definitions. From the list select the items you would like to recover. Once restored an item is removed from the archive. The Add button allows to create a new definition. A dialog is presented for entry of specific values. All definitions use a name and optional make for identification. For scrolling of the list touch and move on the right side (outside of the gray area). This function is only available in case not all of the items within the list can be shown. You can reset this list to default values; please note that all own definitions and customizations are permanently lost. Photoxor C1 Version 1.33: Lightmeter Bug Fixed! Photoxor C1 - Lower Prices for In-App Purchases!